 Club members will be ongoing whilst membership and permission is maintained. When entering our competitions whether internal, inter club or exhibition St Austell Camera Club reserve the right to publish your name and title of your picture/image. St Austell Camera Club cannot guarantee or accept responsibility for data that is “in transit” over the Internet. However once received any data will be held securely, where permission has been granted, and used solely within the scope of that permission in accordance to GDPR 2018 directive. 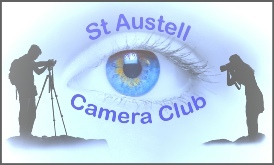 St Austell Camera Club welcomes junior members and requires the member’s details, for contact purposes, that can only be taken with express permission from parent or person with legal parental responsibilities for the individual. Contact with the junior member will be in a manner restricted to the wishes, as stated, by parent or guardian who originally granted relevant permissions. Permission for St Austell Camera Club to hold your information may be rescinded at any time and all data held will be securely deleted from the records. All enquiries please contact St Austell Camera Club President.